Almost no sane person and security aware person uses Internet Explorer still. However still in huge American companies it is heavily used. If you install Firefox or Google Chrome and by mistake you change default browser to one of them then it is worthy revert back default browser to Internet Explorer. Just installed Debian 7 Linux and wondered how to install Google Chrome Browser on Debian Wheezy. It took me a while until I figure it out, as direct download from Google after searching for Chrome Linux had library requirements which are missing from Debian 7 Wheezy repositories. Here you have few options install Google Chrome Beta (whether you prefer you're an innovator), install unstable – if you prefer latest functionality and don't count on stability or install stable version. I personally prefer always to keep stable so prefer to install google-chrome-stable. Only reason I need Google-Chrome is for testing how websites looks with it. 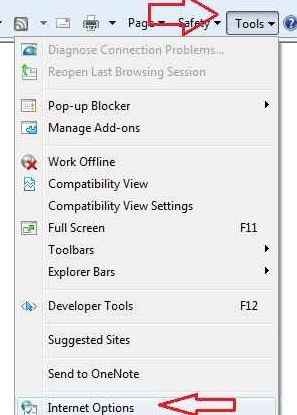 Otherwise I don't recommend this browser to anyone who cares for his security. Obviously as Chrome is product of Google it is almost certainly it keeps complete surveillance on what you do on the net. Often it happens, that some old hosted websites were created in a way so no Web Statistics are available. Almost all modern created websites nowadays are already set to use Google Analytics. Anyhow every now and then I stumble on hosting clients whose websites creator didn't thought on how to track how many hits or unique visitors site gets in a month / year etc. Thanksfully this is solvable by good "uncle" admin with help with of Webalizer (with custom configuration) and a little bit of shell scripting. /var/log/apache2/www.website-access.log*, move files to some custom created new directory lets say /root/www.website-access-logs/ and then configure webalizer to read and generate statistics based on log in there. 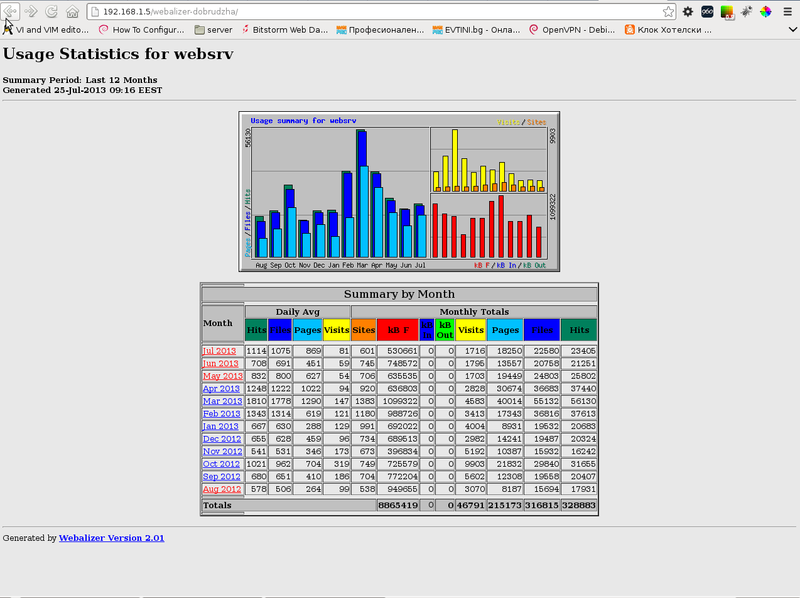 For the purpose, we have to have webalizer installed on Linux system. In my case this is Debian GNU / Linux. and produce usage statistics in HTML format for viewing through a browser. First look de-gzips and second one does create a merged file from all with name access_merged_1.log The range of log files in my case is from www.website-access.log.1 to www.website-access.log.52, thus I have in loop back number counting from 52 to 1. Nmap (Network Mapper) is one of the most essential tools for checking server security. As a penetration testing instrument it is both used by SysAdmins / Crackers and Security Specialists. Its perfect too to make periodic port audits and determine how good is configured server firewall or even in time of building one. Often with time Firewall rules grow bigger and bigger and as a consequence there is a risk of loopholes in FW rules, nmap routine host checks (i.e. run as a cronjob and logging port status on server is IMHO a good preventive measure). I first get introduced to Nmap in the early days of my careers as IT Geek and System Administrator around year 2000. Back then Computer Security and hacking culture was a common thing across IT geeks and ppl hanging in IRC 😉 This article will not say much of news for those accustomed to Nmap, but hope interesting for people newly introduced to Computer Security it will be of use. 1. Checking host status with Nmap (Is remote scanned host up). Most classical way of scanning, since the early days of computing is to attempt connecting to remote host ports opening connection via creating new TCP or UDP protocol socket with C's connect(); function. Hence nmap's "default" way of scanning is like so. Anyways it doesn't scan all possible 65534 ports, when run with no extra arguments, but instead scans only those more popular widespread used. During scan, pressing Enter, prints on screen statistics on how many percentage of scan is completed. In older Nmap, releases this was not so, it is very convenient stuff, as some host scans (with specific firewalls), can have anti port scan rules making the scan time ultra luggish. If this is the case nmap can be run in different scan mode, I'm gonna say few words on that later. Whether scanning a complete range of IPs from C or B class network, it is handy to only scan only ports of interests for example (Apache, SMTP, POP3, IMAP etc.). By default nmap does not scan all the ports in the low ports range 1-1024. This port range according to RFC standards are reserved for standard more often and high priority network services. Default's nmap scan does not scan all of the 1-1024 ports and sometimes, some people prefer to run services in non-standard port numbers on some obscure ports in those port range. It is common that some "hacked (cracked is proper word here)", have secretly install Connect Shell or Connect back shell services running in those port range. Thus scanning those port range on administrated servers (especially whether there is suspicion for intrusion). As I said prior, if no extra port arguments nmap scans only number of pre-selected high use ports. However it is always nice to run complete port scan. Doing complete port scan on host, can reveal unusual open ports for cracker backdoors or ports or whether on Windows (ports open by Viruses and Trojans). As the complete number of possible remote ports to attempt to connect to is (65536), such a scan is much slower and sometimes can take literally "ages". To scan all ports on my home router in a local 100 M/Bit network with my notebook it takes about 23 minutes. 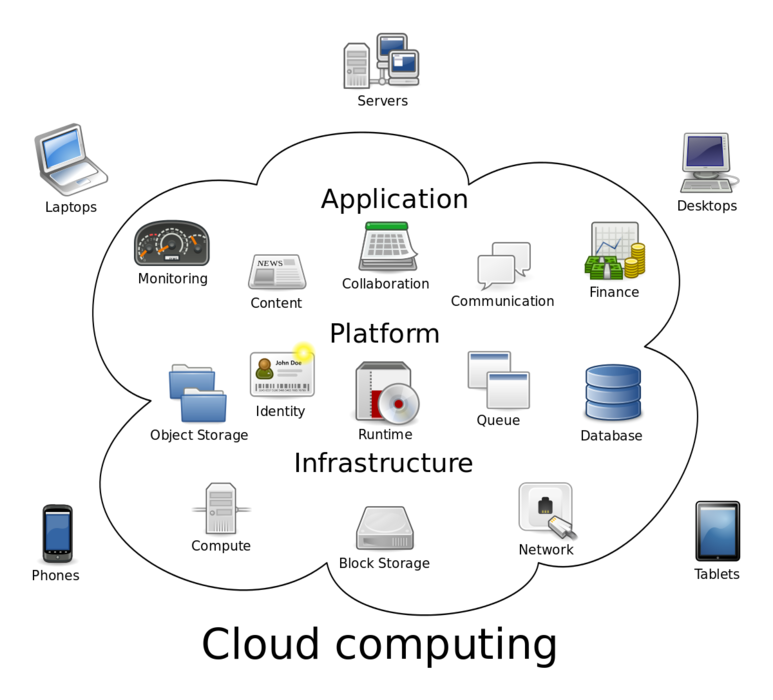 On remote hosts it can take from 30 / 40 minutes to many hours – depending on firewall type on remote scanned host. Also by scanning all ports, there is risk remote host add you to its FW reject rules, whether its running some kind of automated software for Intrusion Detection (IDS) like Snort or AIDE. Host is up (0.0023s latency). Nmap is capable digging version numbers of remote running application binding to port:. Option to try to guess obtain version number is -sV (Show Version). Host is up (0.0083s latency). As you can see from above output OS version guess is far from adequate, as my home router is running a Debian Squeeze. However in some older Linux releases, where services return OS version nr., it reports proper. As many servers run some kind of IDS logging attempts to connect to multiple ports on the host and add scanning IP to filtering CHAIN. It is generally good idea to always scan with SYN Scan. SYN scan is not a guarantee that scanning attempt will not be captured by well configured IDS, or admin snorting on network with tcpdump,trafshow or iptraf. Stealth scan is useful to prevent IDS from raising red lamps. Host is up (0.0075s latency). Nmap has 6 modes of scanning. Whether no Type of scan is passed on with (-T) arg. , it scans in normal mode. Paranoid and sneaky are the slowest but lest aggressive and less likely to be captured by automated firewall filtering rules soft or IDS. Insane mode is for people, who want to scan as quickly as possible not caring about consequences. Usually whether scanning your own hosts Insane is nice as it saves you time. Paranoid scan is ultra, slow so in general, such scan is helpful if you're going to sleep and you want to scan your concurrent company servers, without being identified. Paraonid scan, takes hours and depending on where remote scanned host is located can sometimes take maybe 12 to 24 hours. Almost always -T3 or T4 is reasonable. NSE: Loaded 0 scripts for scanning. Host localhost (127.0.0.1) is up (0.0000070s latency). This scans 4096 IPs for any web servers (without pinging them) and saves the output in grepable and XML formats. Other useful option is -sA (This does TCP ACK Scan), it is useful way to determine if remote host is running some kind of stateful firewall. Instead of connecting to ports to check whether opened, ACKs are send. Host is up (0.0099s latency). I routinely checked, if afterwards all is fine with Qmail?, just to find out connect to port 25 was hell delayed about 40-50 seconds before qmail responds with standard assigned Mail Greeting. I Googled long time to see if I can find a post or forum thread discussing, exact issue, but though I found similar discussions I didn't found anything that exactly match problem. Thus I decided to follow the good old experimental try / fail method to figure out what causes it. and settings as primary DNS Google Public DNS 8.8.8.8, problem persisted so problems with hosts resolving was obviously not the problem. Mail greeting now appears in about 2-3 seconds time. If you happen to run a small business or you're just an adventurer who use Linux for his notebook Desktop. Sooner or later you will end up needing Linux software to convert between world currencies. Some might argue that such a software is obsolete since already there are the Google Currency Converter and plenty of other (online) web currency converter sites. However for people like to use desktop applications like me it is much better to use a separate desktop tool which do currency convertion. If this is the case with and you happen to use Debian GNU / Linux, Ubuntu Fedora or any other main stream Linux distribution on your Linux powered Laptop or Tablet you will be surely happy to know about KEuroCalc – Universal Currency Converter. As all "K"-named starting Linux apps unfortunately keurocalc is using QT KDE graphic library and thus whenever used on GNOME it starts a bunch of KDE services (kedinit,klauncher, kded), however the load of this few on any modern notebook or PC is neglectably low so for most users the only disadvantage of kerocalc might be interface is looking a bit different compared to rest of Gnome GTK+ programs. 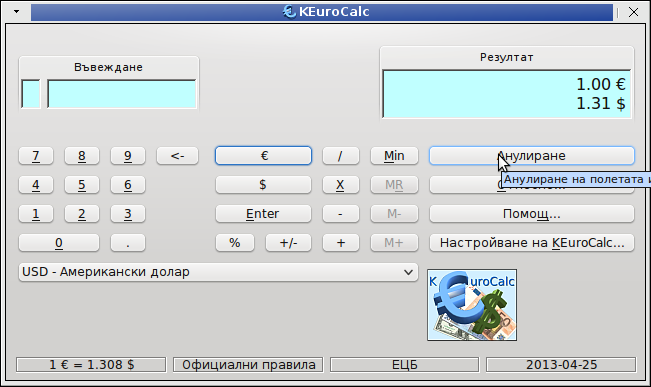 KEurocalc is a universal currency converter and calculator. European Central Bank and the Federal Reserve Bank of New York. 0 upgraded, 1 newly installed, 0 to remove and 23 not upgraded. Need to get 0 B/87.8 kB of archives. After this operation, 319 kB of additional disk space will be used. 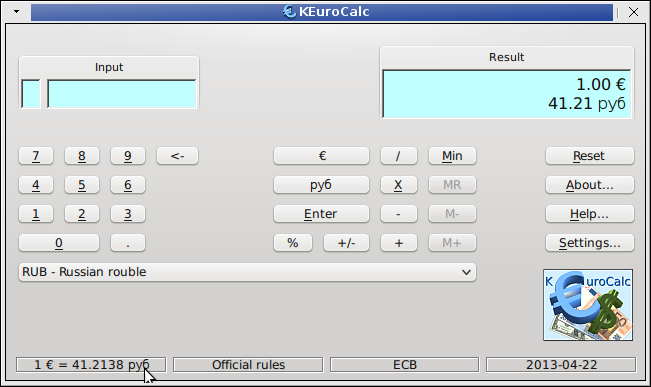 Selecting previously deselected package keurocalc. As you see from settings screenshot, information about rates can be obtained from 2 sources; – European Central Bank and New York Federal Reserve Bank. I give a try also to Euro, no network access (fixed rates only) method but unfortunately by choosing it you can only convert between Fixed Currencies (currencies which are already not in use – in EU member states who dropped their local currencies in favor of EURO). I've tested the program and it works good, the disadvantage is convertion between some of the World currencies of countries with non-transparent planned (Soviet like) economies for example Belarus is not among app list of convertable currencies. 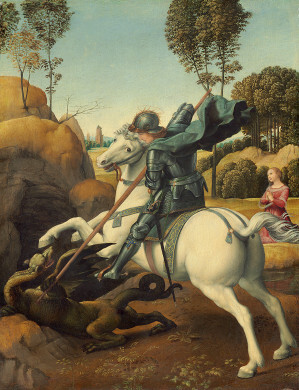 The picture made my childish nature be curious and I clicked on it just to find few articles about Saint George's day in England which happens to be celebrated today in 23 of April. As I myself bear name after saint George it means it is now my nameday in England 🙂 Though saint George is England patron saint because English people are not so religious as earlier, the feast is not considered as Official Public Feast. In Bulgaria we celebrate st. George's day in 6th of may and it is non-working public holiday for all country as well as it is Official Feast of Bulgarian Army. 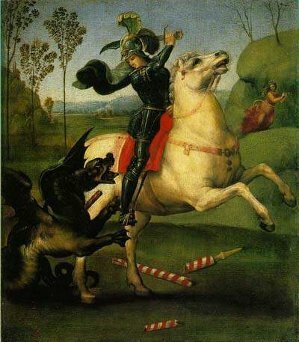 Curious fact related to Saint George's veneration is that the center cross on England's flag is actually saint George's cross of victory – A reference for saint's victory over evil with faith in Christ. In England it is typical flags with the image of St George's cross are flown on some buildings, especially pubs, and a few people wear a red rose on their lapel. Saint's day is most venerated in Salisbury, where there’s an annual St George’s Day pageant, which probably dates back to the 13th century. 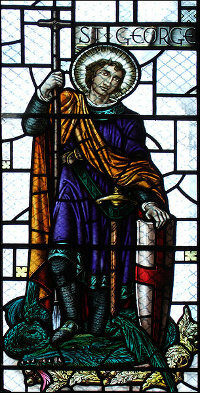 During the crusades in the 1100s and 1200s, English knights used St George's cross as part of their uniform. St. George's cross keeps in England official flag for centuries. Nowadays the flag of England – the so called Union Flag is a combination of St George's cross, St. Andrew's ( X shaped crsoss ) and St. Patrick's cross. Even to this day English football fans paint variation of cross on their face most of which do it without realizing the deep roots of the ancient Great Britain symbol. If you are student or just a researcher, you already know most of the good books you can find are on books.google.com. Google Books's is nice, but not all browsers support it well. Older mobile phones has big troubles with it, plus it is always nice to have a stored copy of book on your PC for later review or just to refresh your memory on books previously read. Google Books Download is said to support Save of Google books in PDF, JPEG or PNG format. This program works good whether you need to extract only certain book pages, however with complete books it often hangs. Other problem is it is proprietary software, (freeware), so pages book pages it downloads in PDF had a big red color stamp complaining the program is trial. There is a cracked version available on Piratebay.se's website. But as Piratebay is filtered from here. 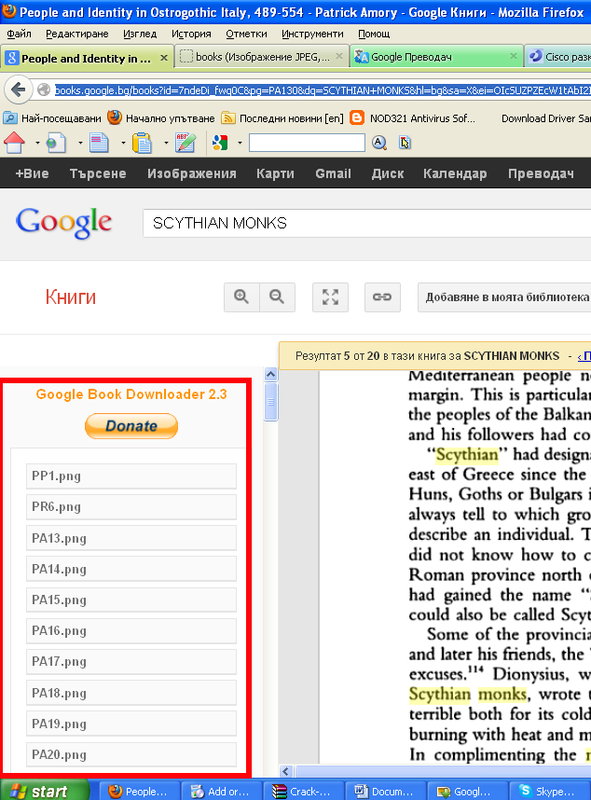 To test it I had to google it via piratebay proxy: – with "piratebay google books download". 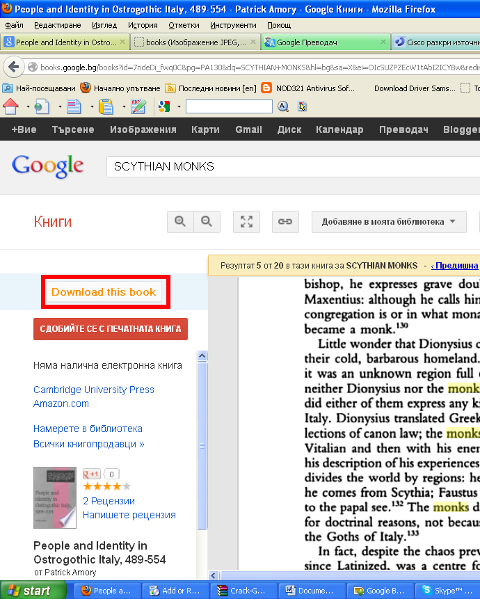 Google Books Download, standalone app from Piratebay is at current version 3.1.308. Download Manually – This is used for manual download a pages from a complete book and converting them to PDF. Download Automatically – Is purposed to download a complete book from books.google.com and converting it to PDF. Downloading a complete copy of book using this mode is sometimes, hanging, plus it is really, really slow. The reason is each of the pages from the Book is first scanned using OCR (Optical Character Recognition) technology page by page and later after all pages are downloaded in pictures, they're converted to 1 PDF file. Because Download Automatically loops at certain pages, this makes Google Books Download almost useless for people looking to store a full copy of books on Books.Google.com …. If you never before heard of Greasemonkey is a Mozilla Firefox Extension that allows users to install scripts that make on-the-fly changes to web page content after or before the page is loaded in the browser (also known as augmented browsing). After a FF restart, you're ready to download any book from Books.Google.com. You should keep in mind that the download links of Google Book pages, will have a time expiry, so if you don't hurry up to save the pictures for later use soon links will become inaccessible and showing as broken from Google – I'm not sure how much exactly is google's max expiry time set of links but I guess it should be something 5-10 mins. Once you have all PNGs saved on the PC you need to then convert them to unified PDF file. One way to do this is using ImageMagick's convert command line tool. I was asked if it is possible to install Skype on a Nokia Mobile N95 8G by a relative of a friend. I remembered I've earlier installed and used Skype on my Nokia 9300i with some kind of Java Skype client, so I guessed installing Skype on Nokia N95 will be much easier and most likely supported by Skype.com's available mobile versions. Further on, I tried downloading from Skype.com's client mobile download versions and after selecting the model of the Nokia N95 OS which is Symbia, was asked for a mobile number to which Skype will be send via SMS. I've typed in the Mobile number, hoping it will be the usual click on link and authorize Skype download and install on mobile, but instead Skype send me in SMS, just a link to Skype's Mobile download section http://www.skype.com/m/ . In other words, typing in the phone number and navigating through the URL from the mobile was completely useless. As I ended on the same place where I could manually browse using Nokia embedded Browser …. , were versions of Skype which I've installed using Nokia Mobile Suite for Windows. Two of the .sisx files in archive Symbian Mobile Skype ver. 1.5 and Symbian Mobile Skype ver 5 did not work on N95. The binary that launched okay on the Mobile was Skype_S60_3_0_v_1_5_0_12.sisx. 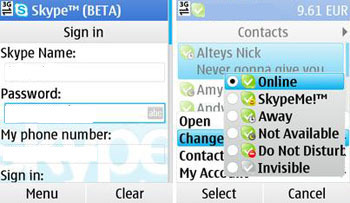 Though this binary launches the client and one can choose between the usual Sign In or Register new skype name buttons, it wasn't possible to login with the username and skype. After a bunch of prolonged waiting trying to Sign in the skype showed up again the Skype Login Name and Password prompts. I spend some more time, trying to Install Fring – free mobile, chat, voice, video Skype substitute program, after reading on few Symbian Forums that fring is able to be used as a mobile substitute for Skype. Just a bit after installing it I've red on some forums some other posts from 2010, saying fring support for Skype is no longer available. I tried also to login to Fring's client with Skype Login and Pass but login failed thus uninstalled Fring and continued researching online whether Skype can somehow be used on Nokia N95 mobile. I've found a Skype Java (.JAR) same file version which I have also installed on my Nokia 9300i and downloaded and tried this one as well. Guess what it works 😉 It is not supporting Outgoing Skype users video clients, and it supports incoming Skype Video calls only with pre-purchased Skype call minutes, but Skype messaging works. I've made mirror of nokiaN95.jar Nokia N95 Java skype program here. I was lazy to research further if there is some other software or Skype.com symbian old version mirrored somewhere on the net working with the N95, but I guess it is possible. If someone reading this post knows a better Skype binary supporting Skype Video and Voice please drop a comment how ? Other way to use skype without loosing time to install Skype client is http://IMO.IM web Skype service.